Baby Sign Language – Benefits for parents, too! 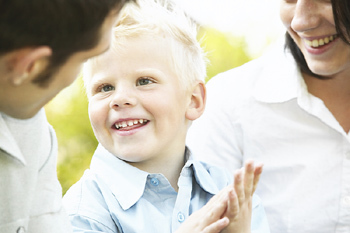 There are many benefits for parents using Baby Sign Language. Being a parent has many joys as you watch your baby grow into a toddler, a youth and finally an adult. In between the joyous moments though are those times when you wish you understood what your baby or toddler needed or wanted. This is especially true during infant-hood. Baby Sign Language takes much of the guesswork out of understanding your infants wants, needs, and thoughts. It is difficult to pinpoint what an infant needs sometimes. Mothers learn to recognize certain signs and crying as indicating something particular such as hunger, or a wet diaper that is uncomfortable. But it is still a guess. It would be such a relief if you didn’t have to wonder anymore, wouldn’t it? By teaching babies sign language, you can carry on a two-way conversation with your infant or toddler. But that is just one of the benefits for parents using Baby Sign Language. It almost sounds surreal to teach sign language to a baby who can’t speak a language yet. But babies communicate with their hands from birth! Think of the first time your infant wrapped his or her little fingers around one of yours. On the first days of life gestures are a way for an infant to communicate with a mother and/or father. After about 6 months, Baby Sign Language will let your infant tell you (and his/her other caregivers) exactly what he or she needs or is feeling. What a wonderful benefit! You won’t have to wonder if your infant is in pain or just hungry. There will be no need to try and interpret crying or facial expressions. You will know much earlier and through sign language what Baby wants at that very moment. Throughout life we come to understand people’s characteristics in large part through their speech. Speech, along with body language, reveals personality. Baby Sign Language will give you an early idea of your infant’s personality. This understanding of infant personality also improves a parent’s understanding of the baby’s other gestures. Baby Sign Language saves parents a lot of time. When an infant cannot communicate needs or feelings, parents spend a lot of time trying to figure out what their child wants. How many times have you seen a parent saying, “Is this what you want? No! How about this?” On and on it goes until the infant is finally (if at all) satisfied. If you think about it, your baby has such specific interests or needs he or she has developed, that satisfaction comes only through obtaining what he or she is trying to communicate. One of the greatest baby signing benefits is the time saved in satisfying your infant's needs. If your baby wants an apple, he can sign and tell you he wants specifically an apple. Improved communication between people of any age lessens frustration. When infants can communicate needs there is less chance of rising frustration levels for both parents and infants. Frustration almost always leads to tantrums on the infant’s part and/or exasperation for the parents. Either way, it is not a fun situation. Baby Sign Language is a key technique for improving communication and reducing frustration. Finally, another of the major benefits for parents using Baby Sign Language is the fact that enabling parents to communicate with their infant (so early!) is incredibly, amazingly, enjoyable. And beautiful! This extra powerful connection adds to the joy of parenthood. This joy also translates into a stronger and exceptionally earlier bond between baby and parents. Having a two-way conversation with your infant is simply an exhilarating experience! 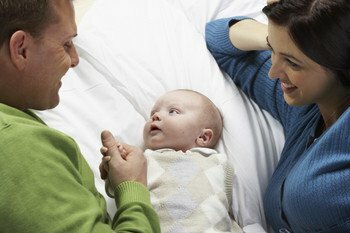 How do I use sign language with my baby? When do I start signing with my baby?